Receive updates from SMDM through e-mail, the web, or social media. The Fall 2018 newsletter is arriving in members' inboxes. View the newsletter here to read about the latest Society updates, commentary, and highlights. To catch up on older news, feel free to browse past newsletters in SMDM's newsletter archive. Want to join the SMDM e-newsletter mailing list? Click the button below! Follow SMDM on social media! Did you know that SMDM is on Twitter and Facebook? 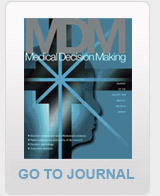 Follow SMDM at @socmdm to receive updates on job postings, annual meeting deadlines, calls for papers, and more. "SMDM is a professional home, providing an excellent international forum to promote methodologically rigorous, multidisciplinary research for health care decision making, networking and career development."